AP Test-Takers' Tweets May Not Give Away Answers, But They Raise Questions Memes about the advanced placement exams turned up on social media recently. Do they break the rules or do they highlight a deeper issue of inequality? No one likes to take tests. Sitting down to take a standardized test on a beautiful Saturday morning would not, almost certainly, be categorized as a fun weekend activity. Yet, it's a requirement many of us face at one point in life. So we sharpen our No. 2 pencils and get to work. When the test is over, it is easy to seek solace in those around who have also finished the sweaty-palmed, nervous experience that testing often inspires. And through hushed whispers, test takers alike find comfort in knowing that someone else also had trouble with why the limit does not exist on question 18. But what happens when these hushed whispers of a confidential test are not so quiet? For the past two weeks, high school students across the country have been taking their Advanced Placement exams (AP). They are administered by the College Board and depending on a student's score, could result in early college credit. As students have put their pencils down, they've picked up their phones and gone to Twitter to share their frustrations. Through hashtags, test takers have categorized tweets about different AP exams. #APLit for the AP Literature and Composition exam. #APBio for the AP Biology exam, and so on. While these tweets are in jest — and many in the format of popular memes --there is something peculiar about them: they are oddly specific. For example, in reference to the AP Literature and Composition exam, many users tweeted about Mr. Pickle and Godfrey. One tweet says that the tester, "went into that test feeling like Mr. Gauntlet and left feeling pretty Mr. Pickles." Another uses an image of a fighting pickle to describe "when Mr. Pickle encountered Godfrey Gauntlet." Then there's the tweet that uses a picture of a pickle-looking character from Spongebob, Kevin the Sea Cucumber, to express how "smug" Mr. Pickle is in the face of Godfrey. These tweets about the exam even inspired a Twitter moment that highlighted the best memes about the AP exam. A Twitter search of #APLit will yield similar results. All of these memes reference a specific short story published in 1751, The Adventures of Peregrine Pickle by Tobias Smollett. While the tweets express the sentiment of the students taking the exam, they do another thing: reference the questions asked of them on the AP Literature exam. In fact, when the College Board released the essay questions for this year's AP Literature exam — it usually releases the free-response questions 48 hours after the exam — the second question asks students to analyze a passage from the short story. So is referencing the test on Twitter shortly after closing the exam booklet a problem? Tina Trujillo, an associate professor at the University of California Berkeley's Graduate School of Education, sees these tweets as an indicator of a larger issue with standardized tests. "This is another data point for college admissions committees to say 'look we should discount these scores,' " Trujillo says. "We need to ask ourselves what are these tests testing if they can be undermined so easily?" Trujillo believes that the tweets bring to light the inequality of who can take these tests and who cannot. 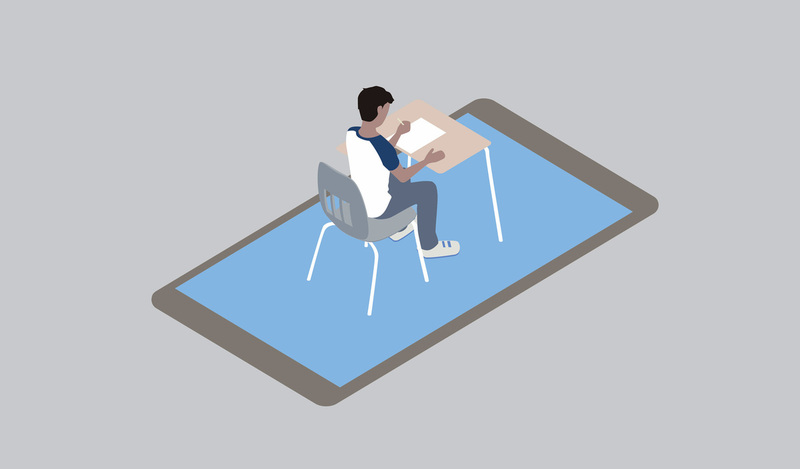 "If you think about which students are on social media right now and who has access to information about the tests, it's those with the greatest privilege to access online content swiftly and regularly," she explains. "Internet access is still somewhat limited in low-income communities. And access to AP tests and the courses themselves is far more limited in low-income communities' schools. "We have to question who is benefiting from the courses and these simple ways to game these course tests and then use that information when considering what utility the tests offer in college decisions, if at all," she continues. Trujillo says she would like to see test makers and policymakers rethink the purpose of these tests and whether they can fulfill that purpose. However, according to the College Board rules, sharing test information is grounds for invalidating scores. The College Board says it will automatically cancel a score if a test taker is discovered disclosing "free-response questions from a regularly scheduled exam within two days of its administration," which includes "discussing a free-response online right after the exam." The rules specify that test takers are not to "email, text, post, or in any other way circulate AP Exam information through any kind of social media, or your AP Exam score may be canceled." In an email to NPR, the College Board said that "sharing exam information in any unauthorized way compromises the integrity of the exam for all AP students, and for the colleges and universities that grant credit or advanced placement for qualifying AP scores." Beyond that the College Board said it would not comment on whether or not there is an investigation into testers' tweets about the exams. Though students are aware of this rule, they may be ignoring it. Following the AP Biology exam, more meme-like tweets with vague references to questions sprouted up.